Since moving from a small NYC apartment a little over a year ago, we have been slowly acquiring all of the suburban homeowner “essentials.” You know, garbage cans, a lawn mower, ladders of different sizes, assorted gardening equipment, etc. I’ve taken a stab at a small garden this year, but I didn’t have the forethought to include an extra zone for it in our irrigation plan. Until we get that sorted out, I’m watering by hand. I like watering. It keeps me in touch with the garden every day, and I get to check in frequently to see how it’s all progressing. It would be a perfect daily meditation if it weren’t for that crazy garden hose! It’s always tangling, getting kinked, and I can never seem to get it corralled neatly enough to stay where I’ve put it once I’m finished. One thing we haven’t yet procured in our new homeownership adventure is satisfactory garden hose storage. So I’ve been searching. Racks: A hose rack is fairly utilitarian and space-saving. It hangs on your wall or in your garden, where you can coil your hose, keeping it off the ground. There are decorative rack designs, so even though it may be functionally utilitarian, it doesn’t have to look that way. You have to do the coiling yourself, which wouldn’t seem like a hard job, but a lot of homeowners (a-hem, me) would admit that, for totally incomprehensible reasons, it is sometimes incredibly difficult. Reels: If you don’t like to get yourself dirty, a hose reel may be for you. 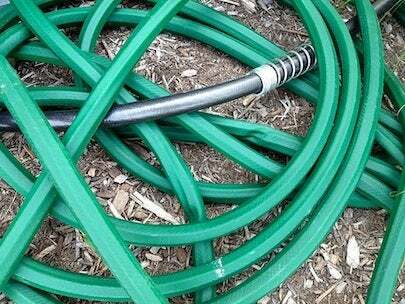 By turning a crank handle, your hose can be easily coiled up without you ever actually touching it. Some reels are combined with wheels or a cart element, so they can be conveniently moved around your yard. Hose reels are very practical but not often decorative. Pots: A hose pot is kind of self-explanatory. There’s nothing fancy about the engineering. It’s a pot in which to put your hose. 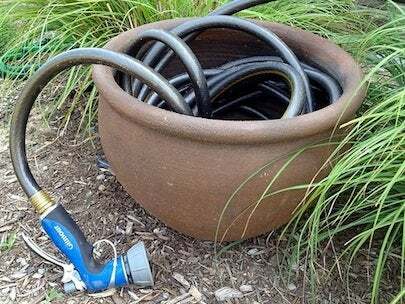 But it’s a good option if you like to keep your hose close to the area you most often water, and you don’t want it unkempt all over your yard or garden. You do want to make sure it has drainage holes, so it doesn’t become a breeding ground for mosquitos or other insects. I’m still trying to decide what’s best for our use. Currently I’m using a large planter my mother passed on to me, but I think I’m leaning toward a reel, or maybe even a pot/reel combo. Whatever I choose, I know with my garden hose properly corralled, watering will become less of a chore, and more of a joy.